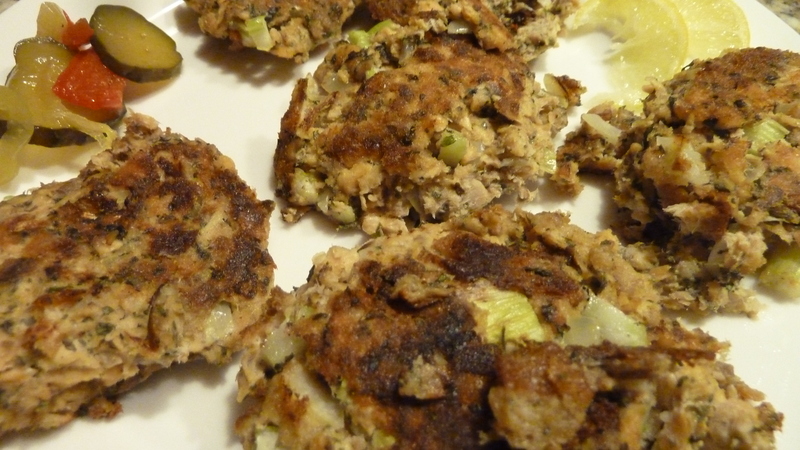 easy salmon cakes, family, food, Mennonite cooking, Salmon, Whatever Happened to Dinner? 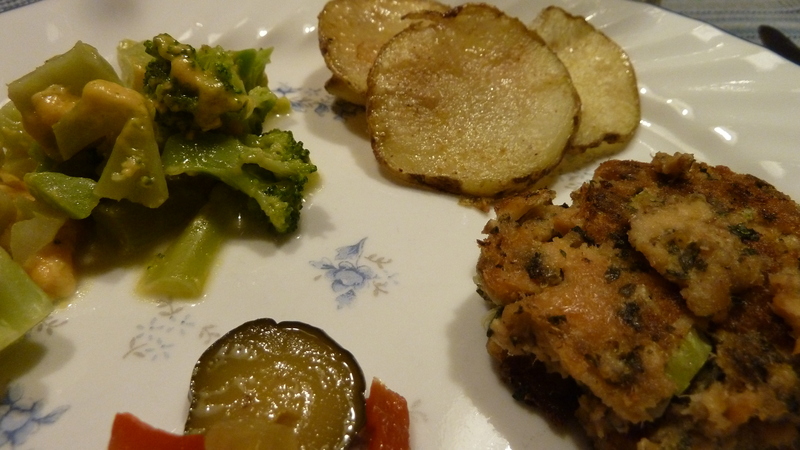 Salmon cakes are as easy as meatloaf and in my mind a similar go to food for a busy night. I usually just kind of throw them together using cracker crumbs (saltines), an egg, a little milk, and some seasoning, then roll them in cracker crumbs and sauté lightly in some olive oil. When I asked MY mother recently if she ever made salmon cakes, she said no (not a big surprise, because I certainly don’t remember them from my childhood) but she added that her mother used canned salmon a lot and my mother got tired of it. Mom said she didn’t know if it was because it was relatively cheap and easy; she recalls a salmon soup her mother made which she did not like at all. I’m my mother’s daughter and that doesn’t sound good to me either. Truth be told, I think my reaction to salmon is the fact that opening a can of salmon gets the cats running to beg, which makes me think of canned cat food, which isn’t exactly appetizing. But, getting over the odor, these are good, adapted from The Essential EatingWell Cookbook (2004) (recipe online at: http://www.eatingwell.com/recipes/easy_salmon_cakes.html). Open salmon can, drain; put salmon in a medium bowl. Flake apart with a fork; remove any bones and skin. Add egg and mustard; mix well. Add the remaining ingredients; mix well. Shape the mixture into 8 patties, about 2 1/2 inches wide. Heat oil in the pan over medium heat. Add patties and cook until the undersides are golden, 3-4 minutes. Turn, sauté on other side; lower heat and cook total of 15 minutes to thoroughly heat through. Make Ahead Tip: Cover and refrigerate for up to 8 hours before sauteing/heating. Nutrition (from Eating Well website): Per serving: 324 calories; 10 g fat ( 1 g sat , 3 g mono ); 129 mg cholesterol; 21 g carbohydrates; 31 g protein; 7 g fiber; 585 mg sodium; 97 mg potassium. Nutrition Bonus: 27% dv fiber, 171 mg calcium (15% dv). Charlotte, over at Mennonite Girls Can Cook, has a similar recipe. If I had found this first I would have tried it, who encourages using whatever you have on hand (mashed potatoes, stuffing) for filler/glue to hold them together.) You can buy either of their lovely cookbooks here. Is there a dish you make just because someone in your household loves it, or that his or her mother made? I think my mom made salmon cakes when I was growing up that were similar to your recipe but since my husband (of nearly 58 years ) doesn’t like salmon , I seldom do anything with it anymore other than the occasional salmon sandwiches.. I only like the red sockeye though. Maybe I should try your recipe though as some of the things he didn’t used to like, he will now try and even say he likes them! I used to make more things from both my parents families but as many of them, our our children were not fond of , after my parents were gone I seldom did them any more. A good many of the recipes I make were things my mother made. My children sure asking me to write then down. That’s really hard! I seldom measure , just mix til looks and tastes right. Also I am really good at taking bits of this and that leftover and adding some thing from pantry in, root buY cellar, to make whole new dish. They like it and want me to make again. I never can duplicate those one of a kind dishes. I like to read and collect cookbooks for fun but I can never follow a recipe exactly. My family is Swiss(German Swiss) and my husband’s side is Norwegian and Swedish . I have added Scandinavian items to my repertoire, like lefse and stewed dried fruits. His mother always made salmon loaf, but we always made salmon puff, which as it sounds is more like a souffle. Both families always used the red salmon over the pink. Two of my uncles married women with the Russian background and I have added some of their dishes, like borscht. Then there are all the ethnic dishes we’ve added, like Chinese and Hmong and Mexican and Cuban and African and Greek and Middle Eastern and Japanese …We made sushi to add to our Christmas eve dinner this year. We’re having Indian tonight. Ooh, it was cooked sushi, if even considered sushi. It was called spam mushubi and apparently is a popular treat/food in Hawaii. Son’s fiance is Hawaiian background. She brought the ingredients along and her mother and she made it for us. It is slices of crisp fried spam sandwiched between sushi rice and then wrapped with seaweed. It was very tasty, though salty. Any of the sushi dishes we make are all cooked, no raw. I have had fried squid and marinated baby squid. Never octopus though. The salmon was smoked though, wasn’t it? I have had lox on bagel with cream cheese and that is smoked salmon. « Where in the world are the Northern Mariana Islands and why would you care?